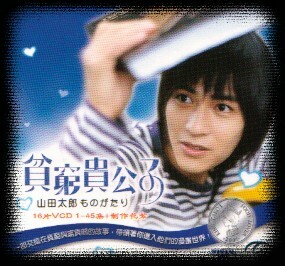 Tai Lang (Vic Zhou), was a university student, with excellent results. Apart from being a excel student and a good sportsman, he has a good and charming look, with gentleman behavior, that has win many girls' admiration. Wherever he go, lots of girls will gasp. The story started when Tai Lang on his way for his first lesson, he met Kong Zi (Ah Ya), that caused envy from the girls. His gentleman behavior and humble style, that made Kong Zi fell in love with him. However, after knowing the truth of Tai Lang's family situation, a family who can't even manage his three meals well, she was disappointed. Although, Tai Lang and his siblings was working very hard to earn for family expense, their simple-minded mother (Yi Neng Jing) always spend their hard-earn money unnecessarily. A funny and humorous drama, with many cute and funny characters to make you laugh and brighten your day. Author Words: Even though, the storyline of this story is not as interesting as Liu Xing Hua Yuan, their humorous and funny level is greatly above Liu Xing Hua Yuan. Nice comedy, quite worth it.